The PMC Output Modules 00-00844 are members of Intellitec's Programmable Multiplex Control family as well as the 160 Channel Multipoint Switching System. They work in combination with the PMC CPU or the 160 channel IPX master and other standard, semi-custom, or custom I/O modules. These modules provide solid-state outputs with the capability of dimming lights. 10 Amps. The total module current is limited by the on the following page. squared rule" It should be installed in a protected environment, inside the vehicle. Using the chart on the next page, set the dip switches 1-4 to address the module. The 844 modules provide the ability to dim lights from any Intellitec multiplex keypad. 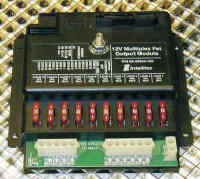 With the PMC system, a momentary push button can be used if it is connected to a PMC input. These modules come in two versions. The 00- 00844-120 works with the 160 Channel Multipoint Switching System. This module dims the lights using pulse width modulation or PWM. Variable power is applied to the load by quickly turning the power on and off. By varying the duty cycle we can vary the intensity of the lamp.